Last night, when No. 2 seed Villanova beat No. 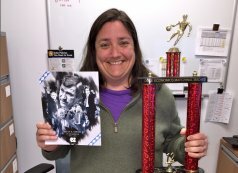 1 seed UNC with a three-point buzzer-beater, Megh Freeland officially won Duke Economics’ annual bracket challenge. Despite picking UNC to win it all, she secured a 10-point lead over the second place and bested 31 faculty, staff, and students. Bracket fees from the 2016 Marchinal Madness competition went to Communities in Schools of Durham, chosen by last year’s winner and Department Chair Craig Burnside. In total, the department raised $530 to help local students stay in school and succeed in life. The winner of the challenge gets to claim ownership of the Marchinal Madness trophy and select a charity for next year. As a big supporter of the American Society for Prevention of Cruelty to Animals and “all who protect any non-humans who don’t have their own voice,” Freeland decided to go with animal protection society Paws4ever in Orange County.